We often hear stories about dogs who have changed their owners lives and at K9 Magazine we love a story that tells the tale of a dog doing a ‘job’ and thriving in it, leading us to wonder what dogs can do, naturally harnessing their skills and senses, that we don’t yet know about. A new paperback book, ‘Daisy’s Gift’ has been written by Dr Claire Guest tells the story of how one incident with her Labrador opened the door for a whole new way in detecting cancer earlier than many tests and machines. It was a hot day and I opened the boot of my car to let my dogs out for a walk. Out bounded my spaniel Tangle, and my little disabled dog Woody patiently waited to be lifted down, so that he could scuttle off across the grass in pursuit. But Daisy, my beautiful fox red Labrador, normally eager to get out of the car and run with the others, stayed in the boot, nudging my chest with her nose and staring up at my face intently with her big brown eyes, forcing me to pay attention to her. ‘Stop it, Daise. Come on,’ I said. But she refused to leap down, and continued to push at my chest, until I took hold of her collar and pulled her out of the car. That evening I realised my chest was sore, and I was blaming Daisy for bruising it until, as I rubbed my breast, I felt a tiny lump. To cut a long story short, I had a very deep seated breast cancer, and if I had waited until I could easily feel the lump, it would probably have been too late. Daisy had saved my life, and I was in no doubt that she knew there was something wrong with me, and she knew exactly where the problem was. There are lots of stories of dogs alerting their owners to cancer and other diseases, but at the time Daisy saved my life I was already in the middle of a major trial to provide scientific evidence that dogs, with their incredible sense of smell, can detect disease before, and more accurately, than many of the tests and machines that medical science has at its disposal. I had been working with hearing dogs, training them to recognise sounds, and I’d talked to friends about all the anecdotal evidence that dogs were helping their owners identify health problems: one of my close colleagues and friends had a malignant melanoma, a dangerous skin cancer, identified by her dog obsessively licking her leg. With my background in dog training, my lifelong love of dogs, and my degree in psychology which had involved a large element of working with animals, I felt that it was time real research was organised to see if it was possible to harness this amazing ability of dogs for the general good of mankind, not just the occasional benefit of their owners. I teamed up with a remarkable man, Dr John Church, who had appealed on the radio for anyone interested in researching dogs’ abilities to get in touch. With the help of volunteers who brought their dogs along, we started the training. It was very difficult to work out how to do it: if you want to train dogs to smell out drugs or explosives, you expose them to the smell, and then teach them to find it. But cancer? We don’t know what it smells like, and we certainly couldn’t provide samples of tumours. But then we had a great insight. Perhaps the urine of patients with bladder cancer would smell of the disease? Nobody minds being asked for a urine sample, although I think my friends got rather fed up with me handing out sample bottles to them whenever I saw them! We needed samples from healthy people as well as from patients with the disease, which we eventually got from a collaboration with a hospital. We quickly found that, not only could the dogs alert to bladder cancer, they could also pick up prostate and kidney cancer, and their detection rate for prostate cancer far exceeds any other test. Again, I’m going to cut a really long story, and a hard battle, short. I am writing this today in my office at the headquarters of Medical Detection Dogs, a charity where we have a team of thirty dogs working on Cancer Detection, Pseudomonas and Parkinsons and where we also train dogs to alert owners who have conditions like diabetes, and who are at risk of lapsing into life threatening comas. The dogs sense the onset of a spike or drop in blood sugar levels long before the owner can. All our dogs live at home with foster families, and come in to ‘work’ for only two or three short sessions every day: the rest of the time you’ll see them romping around the field outside, or chilling on comfortable beds in their own special areas of the building. One of first, and most brilliant cancer-detecting dogs was, of course, Daisy. There is only one firm job requirement for working here: you must love dogs, because they are all over the building. My own dogs: Daisy, Florin, Midas and Asher, are a constant presence in my office, and if you want to sit down to chat to me, you’ll probably have to turf a dog off a chair! It’s been a struggle, especially to get the medical profession to take us seriously. But any visitors who watch the dogs working can see just how good they are, and as they unerringly detect cancer samples, the hairs on the back of your neck stand on end, and tears have been known to well up. One such visitor who was moved by the amazing abilities of the dogs was the Duchess of Cornwall, the wife of Prince Charles, and she and her husband have given us great support. Camilla is now our Patron. Dr Claire Guest is BSc (Hons) MSc HonDSc. DHP BCAh, I obtained a Bachelor of Science degree in Psychology in 1986, followed by a MSc in Psychology by research. In 1992 I became a full member of the Association of Pet Behaviour Counsellors, and subsequently became Chair for three years. From 1987 I worked full-time at the charity Hearing Dogs for Deaf People, leaving my final post of Director of Operations and Research in May 2007. I have been involved in the training of dogs for tasks involving scent for over twenty years; I have trained working gundogs and participated in both competitive working trials and national gundog tests and trials. Since 2002 I have been professionally involved in training dogs in the detection of human disease through scent. In 2003, I was training director of the first programme in the world to train dogs to identify cancer by odour. The findings of this study were published in the British Medical Journal in September 2004. 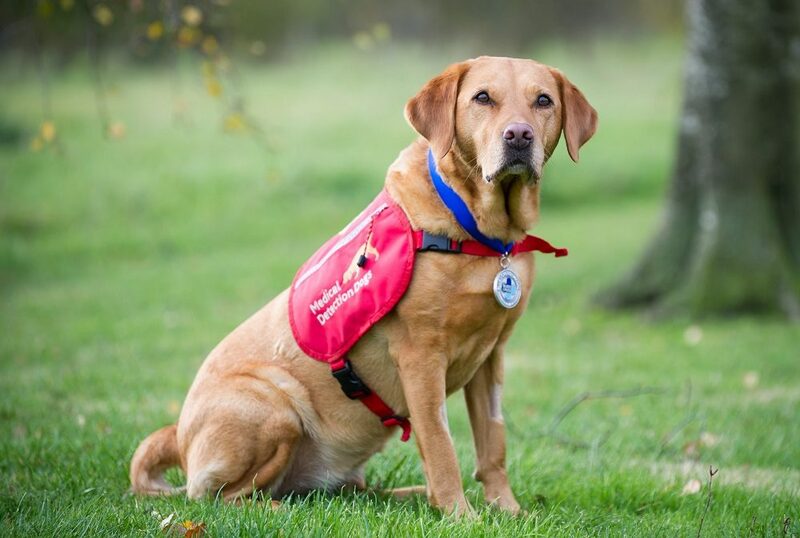 I am Chief Executive and Director of Operations for the charity Medical Detection Dogs, an organisation that trains dogs to identify human disease by odour. We are currently working on a number of pioneering research projects involving canine olfaction, including the training of dogs to detect cancer, blood sugar changes, and Addison’s disease.